Sanchi groaned in annoyance as the sun rays fell on her eyes. She curled up in the blanket and was about to doze off again when pain shot through her lower abdomen due to her movements. She opened her eyes slowly while sitting straight and blushed a deep shade of red as the flashes of last night came into her mind. She looked around for Kabir but he was not there. Thinking that he might be in the shower, Sanchi got out of the bed and collected her night dress which she was able to locate due to the light coming from the curtains. She pulled her dress down her shoulders and went to the door of the washroom. She knocked and waited for a few minutes but on not getting any reply, she opened the door and found the washroom to be empty. She furrowed her eyebrows in confusion but proceeded to carry out her morning routine. After freshening up, she decided to find Kabir. As she made her way downstairs, she realized that she had not had a complete tour of the house. The excitement of exploring the house over powered her thoughts of searching Kabir and soon Sanchi found herself in the hall admiring the beauty and simplicity of it. 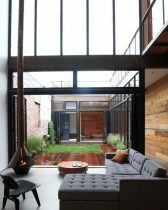 She saw the glass doors that led her to an open area with grass floors and across from the small indoor greenery was another room with sofa and dining table. The room looked quiet formal and elegant. The room was connected with the hall by a narrow corridor along the glass walls. 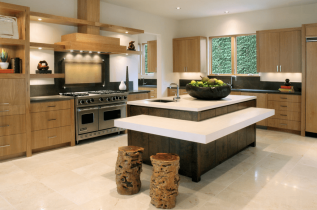 After viewing the place with amazement in her eyes, Sanchi made a beeline towards the kitchen. She loved this part of the house and the kitchen was like a heaven on Earth for the chefs as she explored the expensive china crockeries in the polished and well furnished trollies. She found another small dining table in the centre of the kitchen. This confused her. ‘Why are there two dining tables in the house?’ She wondered as she ran her fingers on the black marble of the table. Next she went to the familiar part of the living room. She turned around the same wall as she had done in the night to find the grand piano shining due to the rays of the sun falling on its gloss finished surface. 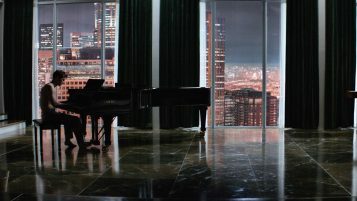 The sight of the piano took her back to the night where she had seen her alluring husband who was half dressed play the piano skillfully thus drowning her into the world of music. Sanchi blushed as she remembered the events that followed after. She then reached the stairs which had not yet climbed herself as she was so happily aided by Kabir. She went up to the first and only floor of the house to find only two bedrooms. One was her and Kabir’s room and the other was a plain simple room just as all the other three guestrooms she had spotted in the living room. She went to her room and saw it properly in the day light. It was a beautiful contrast of grey and white. She was adoring the interior of the room when the crack between the curtains covering the long windows held her attention. She pushed them apart to reveal a small balcony with chairs and an awesome overview of the gardens surrounding the house and also the high rise buildings of the metro city. She stood in the balcony for a few seconds as the breeze caressed her face gently before she turned and went into the bathroom. She entered the bathroom with eyes wide in admiration. She had been into the bathroom before but the beauty of it just left her helpless. The bathroom had black marble tiles as flooring and white accessories just added in its beauty. She also saw the bath tub as she planned on have a long bubble bath shortly. She then turned and found a door in one of the walls. She furrowed her eyebrows as she recalled not seeing it the two times she had used the bathroom. She went to the door and slightly pushed it but nothing happened. She then tried it with much force but again the door did not budge. Confused, she slumped her body on the door and her legs shifted to a bit right only to meet the water. She lost her balance as she slipped and the door slid open to the right side and as a result Sanchi fell on the floor of the room on the other side of the door. 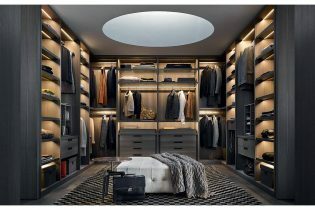 Cursing herself for her stupidity and carelessness, she turned around only to find a magnificent walk-in closet. Her mouth hung open as she took in the place. It had several racks of ties and shoes. Kabir’s shirts were all hung up neatly in one of the shelf and his pants and suits on the other. She found her bag near the small couch in the middle of the room. She sat on the couch and rubbed her leg and elbow where a small bruise was beginning to form due to her fall. Groaning from the pain, she got out of the closet and went to the kitchen in search of the ice. While descending the stairs, she saw another set of stairs that were directed towards the basement of the house. 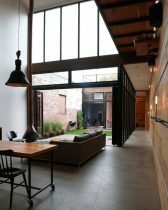 Curiously, she skipped down the stairs only to step inside a well furnished and neatly kept office. Printers and scanners were lined along the small shelf besides the single desk with a computer and some accessories on it. A small chair was placed in front of the desk and the room was lighted up by the sunlight coming from the windows on the other side of the room. Certificates and trophies adored another shelf on the wall of the room. Sanchi carefully stepped down the stone showpiece kept on the floor near the stairs and made her way towards the shelf. She was viewing all the certificates of Kabir’s business achievements and the trophies accompanying them when she heard a small voice in her ear. She turned around to come face to face with Kabir who had his trek pants from the last night on and a cup of coffee in his hands. Sanchi smiled at his greetings before she actually let the words reach her mind. Her eyes widened as she saw the clock that was hanging on the wall where the desk was aligned, just above the AC. S: Its 1 in the afternoon! She exclaimed as she faced Kabir with a shocked expression. S: Why did you not wake me up? She asked as Kabir leisurely took long sips of his hot coffee. K: Sanchi we slept at around six in the morning. I myself woke up one hour ago. He replied casually as he proceeded to take another sip of his coffee. S: I missed my sun rise. She whined as she pouted and saw the full light of the sun from the windows in his office. Kabir watched the pout on her lips and he so wanted to kiss her pout off. He wanted to take her right here in his office, on his desk but he knew that she was in pain. He had not intended to go for a second round yesterday but seeing her in his bath robe just sparked something within him and seeing the desire in her eyes was just adding fuel to the fire. He knew that he had to take her. Shaking off the thoughts of a naked Sanchi under him, he glanced at his wife and saw that she was dressed in the night gown. He checked her out while she was busy whining. He saw the red mark of his hickey on her collar bone and also another one near her left earlobe. He smirked at the sight of them and let his eyes wander off to her creamy legs. He saw a red bruise on her knee and furrowed his brows as her tried to remember him being the one to give it. K: Sanchi where did you get this from? He asked as he pointed towards her knee. Sanchi looked at his direction and sighed before answering. S: I slipped in the bathroom. Kabir checked her up and down again for another sign of injury but on not finding any he asked for confirmation. K: Are you okay? Where else did you hurt yourself? Sanchi shook her head and waved her hand in a dismissing gesture as she answered his question. S: Oh it’s nothing. I just got hurt on the knee and the elbow. She confessed pointing towards her left elbow. Kabir took her elbow and bent it to have a better look. There was a big purple bruise on it. He shook his head at her behavior. He questioned as he pointed towards her sore elbow. Sanchi nodded and smiled but winced as Kabir moved her elbow a little to have a proper look. Kabir sighed and took her arm, leading her out of the room and up the stairs. He said as he dragged her towards the kitchen. He sat her down on one of the stools and took out two ice packs from the fridge. Handing her one as she put it on her elbow and bending down to keep the other one on her knee. She hissed at the sudden contact of the cold ice but relaxed once the ice started to show its effect. K: What were you doing in the office? He questioned as he moved the ice pack around her wound slowly. S: Oh actually when I got up you were not there and I decided to search you but while I came down to the living room I remembered that I did not have a tour of the house so I began to explore it and then I found you in the office. By the way why do we have two dining tables in the house? I did not find your gym also! She exclaimed as she suddenly thought about it while gazing at the toned chest of her husband who was kneeling down in front of her and icing her hurt knee. K: The room near the living room is for the purpose of attending my business colleagues. Whenever they come here for a meeting, we have dinner on that table and that is also my meeting room. The gym is in the basement near my office. He answered her questions. The Sanchi he was seeing now was different from the one before marriage. She was much more formal and stiff before marriage but now she looked much at ease almost like at home with all the ranting and whining. He removed the ice pack from her knee and saw the redness had decreased and hence he got up from his position. He went to the sink and washed his hands before returning back to the table to see that Sanchi was walking towards the door with the ice pack still on her elbow. K: Where are you going? S: To unpack my clothes. K: Let it be. We are leaving this evening. Sanchi furrowed her eyebrows as she turned around to look at him. K: On our Honeymoon to Thailand. S: We are leaving today in the evening? She asked to confirm and Kabir nodded confusedly to her question. S: I have to pack my stuff. Half of my dresses are in one bag and the other half are in another. You could have told me beforehand about the trip, I would have packed accordingly. She continued as she rushed up the stairs and went straight to the closet where her bags were kept. Kabir sighed as he remembered telling her about his plans but she was just too nervous about the wedding and also busy with the shopping. He too got out of the kitchen and went to his office to get some work done before going on his ten days long honeymoon. Sorry for the late update but I was busy. My exams just got over and my new semester id starting soon. I hope you liked Kabir’s house.